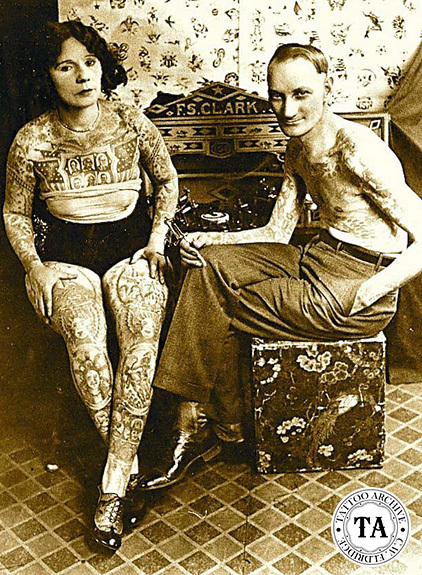 As the circus sideshow spread tattooing from coast to coast in America, many old school tattooists recalled seeing their first tattooed person in the sideshow. They admitted that this had a major impact on them choosing the art of tattooing for a livelihood. Lady Viola, aka Ethel Martin, was one of those circus troopers causing a stir in the tattoo world and in outdoor amusement businesses. The Bowery-Coney Island-Brooklyn tattooist Frank Graf tattooed her in the 1920s. In a Bob Shaw interview in 1989, Bob remembers the first time he saw Lady Viola in St. Louis, Missouri. "The fellow who did Lady Viola's work was way ahead of his time. If you ever can get one of those photos and blow it up, you'll see all those little flower designs have heads in 'em, that's the popular people of the time, like Charlie Chaplin and Tom Mix. He was the first person I saw really do portraits; he did presidents Wilson, Washington and Lincoln across her chest. You looked at them and immediately knew who it was." An April 8, 1930 news article stated that Lady Viola got tattooed so she could travel and work with her husband Captain Gulliver. The Captain was an eight foot three inch giant that made his living in show business. 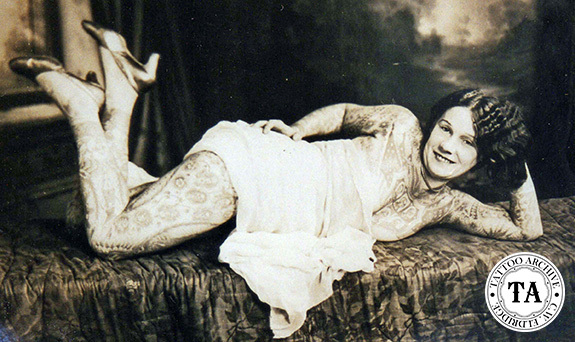 Lady Viola did have a very special suit of tattoos, often being billed as "The Most Beautiful Tattooed Woman in the World." Along with popular tattoo figures of the time, she had the United States Capitol on her back and the Statue of Liberty and Rock of Ages on her legs. That 1930 news article went on to state that Lady Viola’s body suit cost $485.00. During the outdoor season she worked with the likes of the Ringling Bros. Circus (1932) while the winter months found her in dime museums like Gorman's in Philadelphia (1930s). Lady Viola spent decades in the show business world and was still working with the Thomas Joyland Show at the age of 73! Many photographs and pitch cards of Viola's career have survived. Fred Clark, a Midwest tattooist who did photography as a hobby, took many beautiful photographs of Lady Viola that she used for pitch cards. Several of them included Clark and his Amund Dietzel-built traveling tattoo case. 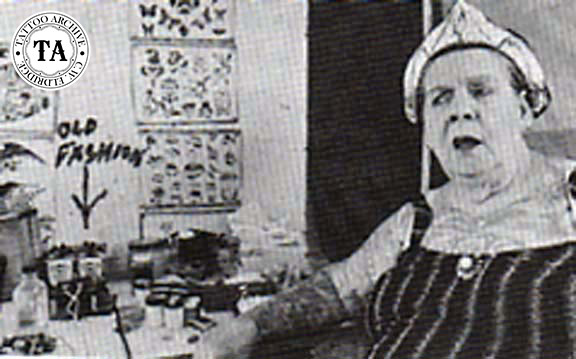 Although Lady Viola made her name as a tattoo attraction, like many other female attractions (including Betty Broadbent) she also did some tattooing. During the circus season attractions would be required to do a certain number of performances each day so there was not much time for tattooing during the show season. But during the winter months Lady Viola worked dime museums as an attraction/tattooist.